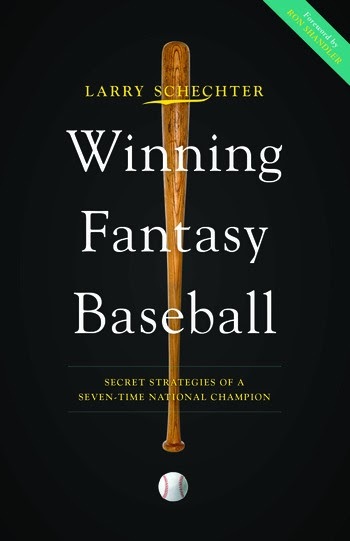 I cannot recommend Larry Schechter's new book - Winning Fantasy Baseball enough. There are many books about Fantasy Baseball and I have read a lot of them. I have read the fantasy baseball books by familiar names like Golenbock, Patton, Waggoner, Benson and Shandler and I've read many of the not so familiar names - Childs, Hendricks... Let's just say that If you've written a fantasy guide and wondered who that buyer on amazon was - look no further. I typically buy half a dozen of the fantasy annuals/packages and a bunch of magazines to boot. I know how much information is out there. I wanted to point out just how much fantasy material I have read and continue to read so that my next statement has the weight it deserves. That may seem like high praise and it certainly is. This is not your typical fantasy guide full of player blurbs, sleepers and pages and pages of player statistics and values. Instead this book is very simply a guide to playing and winning at fantasy baseball. This book offers a very logical approach to fantasy baseball that anyone could follow and adapt to the time they devote to fantasy baseball preparation. If you are anything like me you realize how similar most fantasy guides are in the advice that they offer. Larry's book is different. In fact, depending on how attached you are to the typical views that so many so-called experts have pounded into your thoughts, the material presented could prove to be anywhere from enlightening to infuriating! For those that do not know, Larry won his third straight AL-Tout Wars Championship in 2013 and USA Today's LABR-AL as well. He is making beating the fantasy industry's experts look deceptively simple. Like many of us, Larry Schechter began playing fantasy sports in the early 90's. He started making a name for himself in the 2002 CDM Diamond Challenge when he finished first and won a $25,000 grand prize. Then he did it again in 2005 becoming the first person to win the Diamond Challenge twice. Anyone who trounces the best competition that Tout-Wars and LABR and the Nationwide Contests have to offer, probably has some advice and perspectives worth your consideration. 1. The Importance of Being Prepared - Larry believes that one of the primary factors in his success is his willingness to take the time to properly prepare and through preparation simplifying the draft process. 2. Calculating Player Values and Utilizing Them - In Larry's view there is very little more important to winning fantasy baseball (or any other fantasy sport) than calculating player values and then acquiring as much of that value as possible. 3. The Value of Sabermetrics and How and How Not to Use Them for Fantasy Baseball - Larry shows how the improper use of advanced statistical measures can actually hurt your fantasy preparation. It is all about the context. 4. The Draft Curve and How Position Scarcity is Mostly Nonsense - You will not have any problem finding a dozen articles that insist that there is position scarcity and that those that ignore it are bound to suffer. Larry uses his draft curve to demonstrate how little effect so-called scarcity has. 5. Optimal Bidding Strategies and How to Make the Most of Auction Nominations - I have heard a thousand times from hundreds of fantasy owners that early in an auction you should not name the players you actually want. Larry shows how silly this notion is. I think it is very important to point out that this book does not prepare you for the draft. This book teaches you how to prepare. While Larry believes that owners should create and use their own player values (and he explains how this creates an advantage) this book would also be an excellent complement to many of the available player/strategy guides. If you read between the lines a bit you will realize how easy it is to use Larry's ideas with your favorite expert projections. If you are math or Excel-phobic or intimidated by the idea of creating your own player values, you can always use an excellent tool like Rotolab. With Rotolab you can plug the calculations Larry teaches you to make directly into the program. You can also use Rotolab to build your own player values and the program will do all the calculations for you. Larry's book is truly great and a very fun read. In addition to all the knowledge that he shares on player values and draft strategies, you will enjoy the stories about Tout Wars and other leagues in which Larry has participated. If anything the book is too short, I would happily devour another hundred pages on keeper and dynasty leagues. The book is available on Amazon right now, go get it!